Onswipe’s first HTML5 hackathon concluded sunday with winners in Design, Data, Best Application of Touch and Best Overall project. 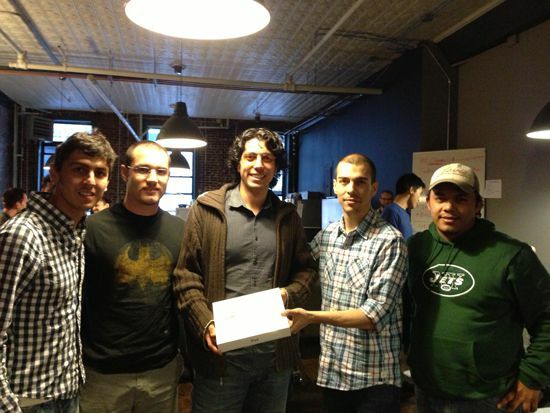 Hailing from Brazil, Colombia and Mexico, via Utah and Connecticut, the team of BlahBlahLearning won Onswipe’s first HTML5 Hackathon in New York City. BlahBlahLearning is a platform helps people practice or learn a new language with real people with one-on-one real-time video. Some of the team members moved to US, solely to learn and practice english. “The members of our team speak more than 2 languages at home, and we’ve had the desire to continue practicing and learning new languages. However, it was hard to find French and Italian speakers.” Explained Eliecer Andres Trillos, one of the blahblah founders. In less than 48 hours the BlahBlah team was able to build a solution for their own problem. Onswipe Software Engineer LD Libra served as engineering mentor for the team.